Your folks just showed up this evening (Jan 23 @ 9:15 p.m.) and we were thrilled to see them. We called Monday (Jan. 22) and today (Jan. 23)...you are here!!! Thank you so much for wonderful service. "Thanks for this new monitoring system. It was installed just this week and now it is reporting to me. What efficient service." My wife and I just moved to Port Sydney from Burlington, Ontario. Our new home was equipped with a Superior propane tank and water heater which we were unfamiliar with. We did a bit of our own research and then asked around the neighbourhood for recommendations of propane carriers and service. The vast majority of locals including business owners strongly recommended BUDGET. At first we thought we'd just leave it all in place and continue on with the existing service. After calling Superior, who wanted to record phone calls and lock us into a 5 year contract...we decided to give Budget a phone call. The service people at Budget, just made us feel a lot better about their product and service. Budget said we could sign up for a year and they'd switch out the tank PLUS they were less expensive. Next thing we knew.....Dan the Propane man showed up at our house. We really enjoyed talking to Dan about this choice and he took the time to explain the entire process. Dan is an excellent representative of your company and we really appreciated his time, attention and care. By the way....Dan located a cracked flange on the out-going system that had probably been leaking gas for some time. Thanks again to DAN THE PROPANE MAN and BUDGET. We are very happy to be your new customers. "I just wanted to send a quick note to express my appreciation for the work completed by Dan 'the Gas Man'. As a new to propane customer, he took the time to ensure I was comfortable with the product and equipment. I can't say enough to how impressed I was with his work!" "We have been very happy with you and your service over the years and that will continue." "I want to pass on to you our delight with the great service we have had from your staff. Gerry was the sales rep who came to our property and thoroughly explained what we needed. Your service techs, Dan and Brent, were here today to install our new torpedo tank, hook up to the furnace and hook up to the barbecue. They arrived on time and worked through the torrential down pour. We were very impressed with their professionalism. They also took a few minutes and helped us unload a sofa." 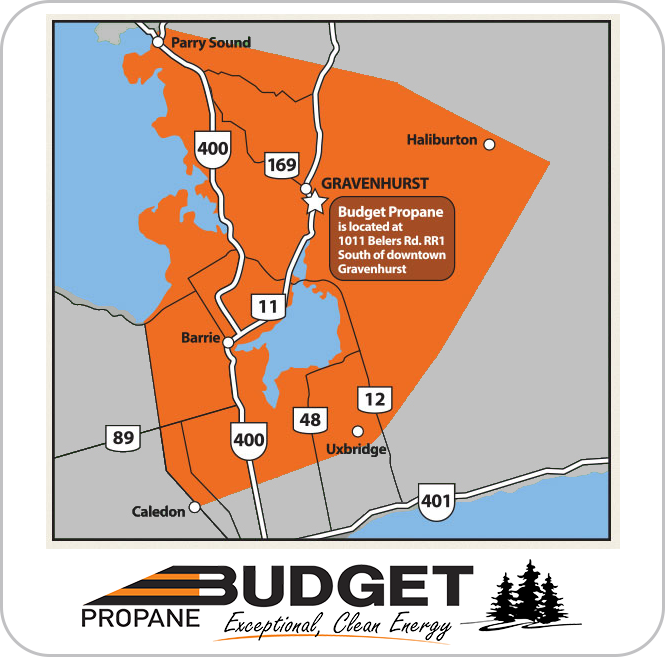 If you have feedback or questions for Budget Propane, please feel free to contact us.